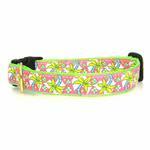 Vacation everyday with the Pink Palms Dog Collar by Up Country! 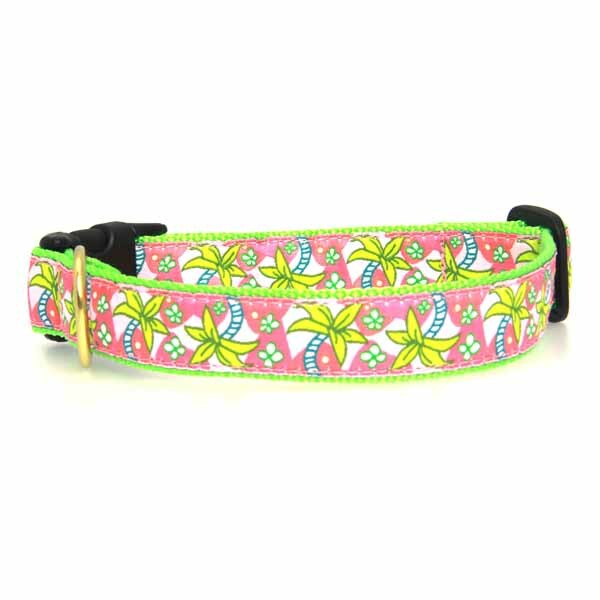 We love the pretty color combinations in this sweet and cheerful Pink Palms ribbon dog collar! It will remind you of a day at the beach. 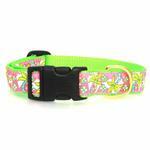 Now you can relive this happy memory with your pup daily with this colorful dog collar! Although this has a sweet, cheery appearance, this dog collar is tough! It's made from high-tensile strength nylon webbing with sewn on polyester/nylon ribbon. 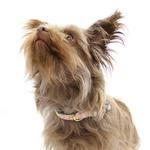 This collar is also stain and fray resistant and stands up to heavy wear! Should it get dirty, simply toss it into the washing machine and let it air dry. The adjustable collar also features heavy-duty hardware. The solid brass D-ring is cast, not welded brass for extra strength. The quick-snap buckles are Coast Guard approved for high weight hold. This playful dog collar is made in a wide range of sizes to suit most any dog - from tiny teacups to the giant breeds! The cheery look will enhance your dog's natural beauty. Best of all, this collar is made with care in the U.S.A.! Collar Care: Machine wash cold, air dry. Look for our matching Pink Palms Dog Leash, sold separately. Posted On 04/19/17 by Jodie T from , TX Yes, Jodie T recommends this product! Very pretty, made well, arrived fast. Cuter in person. Colors are bright. I bought the leash also. Posted On 09/10/16 by Michelle K from Athens, AL Yes, Michelle K recommends this product! Not only was I thrilled to get this collar but purchased matching leash too. Love the colors. Love the Beachy pattern. Love how well made. THANKS BAXTERBOO!